Venos Dry Cough quickly soothes dry, hacking coughs. Beechams Venos Expectorant's is a soothing, warming formula which helps clear your chesty cough. Beechams Venos Expectorant's soothing, warming formula helps clear your chesty cough. 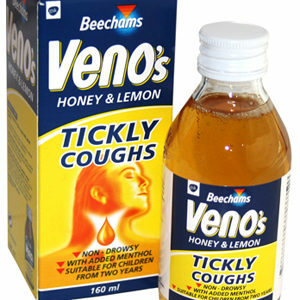 Beechams Venos Honey and Lemon provides soothing strength for tickly coughs with added menthol.